Sarah Spain is a radio host, anchor, and sports reporter, well known as espnW.com columnist, ESPN Radio host and SportsCenter Reporter for ESPN. Sarah Spain was born on August 18, 1986, in Cleveland, Ohio, United States. Sarah rose up in Lake Forest, IL, where she was an All-Conference and All-Area basketball player and was All-State in both field hockey and track. She attended Cornell University, where she was a heptathlete and co-captain of the Track & Field team. She graduated with distinction in all subjects. She was a member of the National Society of Collegiate Scholars and the Golden Key National Honor Society. She was also a member of the 400 Club, honoring Varsity athletes with a semester GPA of at least 4.0 and gained the Blanford Award for the Varsity Track & Field senior who scored the most career points. She also graduated from the Second City improv comedy conservatory. After college, Sarah shortly worked at Intersport Television in Chicago before moving to Los Angeles. She spent 6 years in L.A., where, she used to work as an associate producer for “The Final Score” on Fox Sports Net and as a freelance acting, sportswriting and hosting for Fox Sports. Then, in late 2008, Sarah turned to the Midwest to work for Chicago start-up website " MouthpieceSports.com" where she jacked off all trades there, acting as a producer, writer, and reporter. In 2009 Sarah turned gears, writing a popular sports blog on "ChicagoNow.com", acting as a recurring guest-host of “ChicagoNow Radio” on WGN AM-720 and working freelance writing. Sarah also did some sidelines reporting for the Big Ten Network and hosted the Coors Light Fantasy Players Minute, an online fantasy football show. In early 2010, Sarah assisted launch WGN-TV’s “Chicago’s Best,” joining co-hosts Ted Brunson and Brittney Payton to highlight the very best food, drinks and more in the Windy City. In 2010, she joined ESPN 1000 in Chicago and at the same years, she became a writer for espnW.com. In 2015, it was declared that ESPN was launching a new radio show " Spain & Prim with Spain". In January 2016 Spain along with Jane McManus and Kate Fagan launched a new national ESPN Radio show, "The Trifecta," and Spain launched her own ESPN podcast, "That's What She Said." Spain performed on a variety of ESPN television shows such as "Olbermann," "Mike & Mike," "His & Hers" "The Dan Le Batard Show with Stugotz," "First Take," and "The Sports Reporters". In September 2016, Spain joined a new multi-year deal with ESPN and started the new national ESPN Radio show, "Izzy & Spain", with co-host Israel Gutierrez. She attracted the media attention when she married her longtime boyfriend, Brad Zibung, a real estate owner, well known as the founder of “The Heckler,” a monthly satirical sports newspaper. After dating around six years, they married in front of more than 300 guests in Chicago, IL on May 29, 2016. On November 2016, they went on their honeymoon, making the occasion of Zibung’s 40th birthday. The couple met at a charity bowling event, hosted by Blackhawks defenseman Brent Seabrook in 2008. The couple's first date was at a Cubs game, meeting in the bleachers while the North Siders faced the Cardinals in 2009. At that time, Spain was unknown about him as he had a different facebook identity. 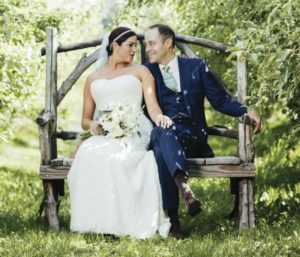 For her, her husband was just someone who worked at “The Heckler.” The two started to live together as their relationship blossomed with time Since 2011. That was fine with Zibung, who did not think of the game as a date either. He said, “And that’s how I was able to meet Sarah”. Spain said, “Brad is just kind of cool with everything and picks his battles with what he truly cares about”. She added, “It works out really well.” Zibung further added, “The worst-case scenario is I would get to know this person who’s involved in a lot of cool stuff in the sports media landscape”. They also considered they don’t want to leave Chicago. They have season tickets to most of the local pro sports teams. They are close to their families and love living in the city. The couple has a pair of dogs, Fletch and Banks. They revealed that “it’s unlikely they’ll have kids”. They are living happily in their home at North River along with their two dogs. Sarah Spain is reported to earn the annual salary of $150,000 and her net worth to be $900,000 dollars. On the orther hand her husband, Brad Zibung’s net worth is $1.5 billion. In her spare time, Sarah loves live music, great food and wine, improv comedy, board game parties, charity work and dominating rec league softball, volleyball, basketball, and football games.